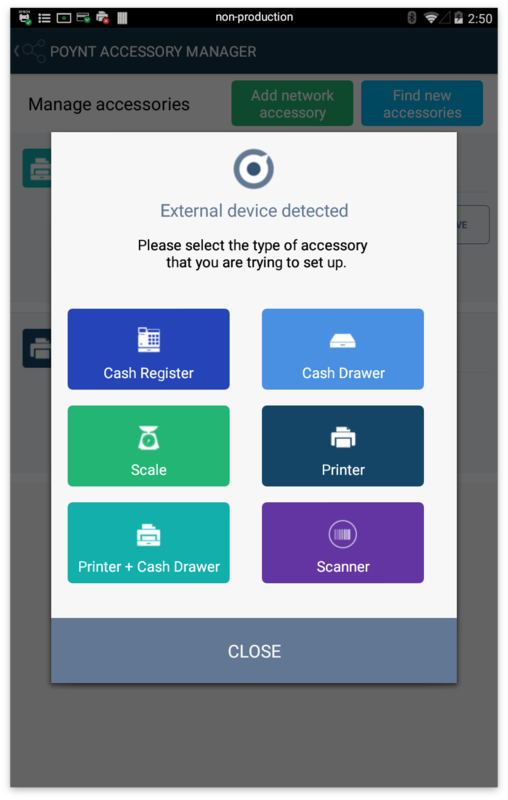 Peripherals, or external accessories like printers and cash drawers, allow merchants to use tools that make managing their business simple. These can easily be connected to your Poynt Smart Terminal using a USB or network connection. Note: Not all peripherals are supported by all processors. Please consult your Reseller Organization for more information. Note: A list of supported peripherals for Elavon merchants can be found here. Please reach out to Elavon support for any questions on availability and pricing. Step 2: Once connected via USB, the terminal will display that it has been Connected. You may test it by selecting and doing a test print. Step 1: Go to swipe-down menu from Home screen and select “Settings”. Select the “Accessory” section. Step 2: Click “Add network accessory”. This will launch a menu where you will select the type of accessory you’d like to set up. Step 3: Once you select your accessory type, the available models will appear. Select your model and then click “Connect”. Step 4: Enter IP address. Each network peripheral will have a unique way to identify the device’s IP address. If you don’t know the IP address, review the peripheral’s manual for instructions. 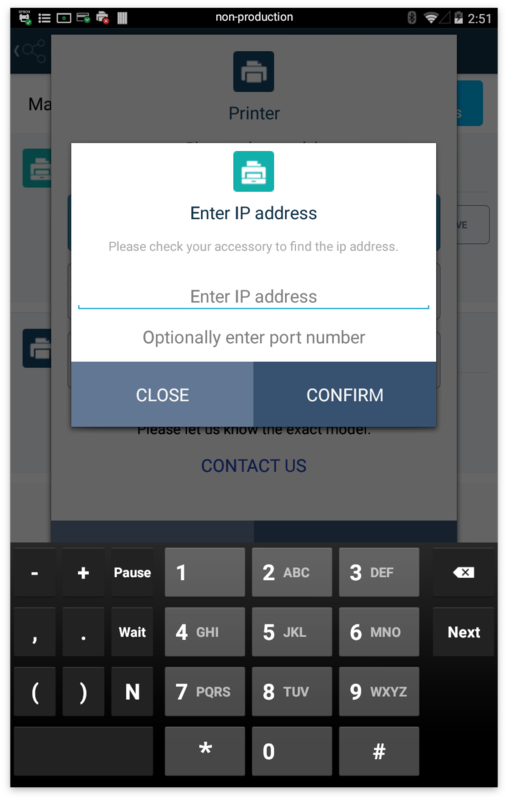 Step 6: Test the device from the Manage accessories list to confirm connection. 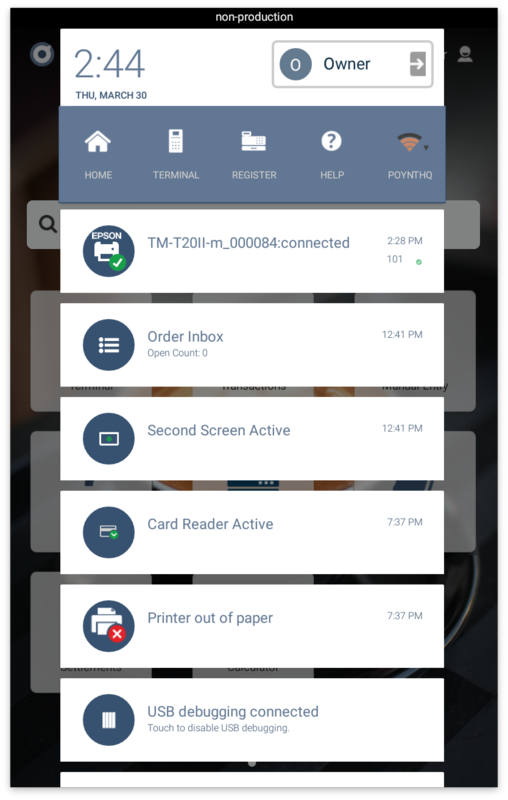 Manage external accessories or peripherals by accessing the swipe-down menu, selecting Settings from the blue bar, and clicking “Accessory”. 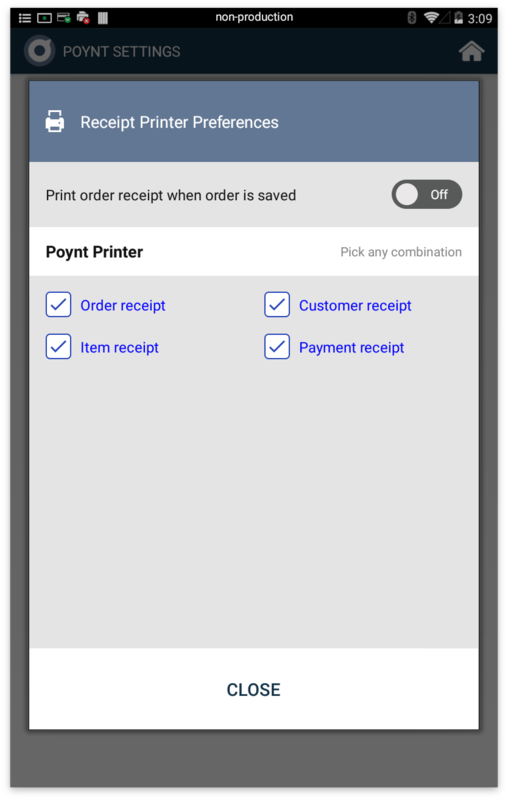 Your Poynt terminal comes equipped with a printer that you can use to print receipts and settlement reports. 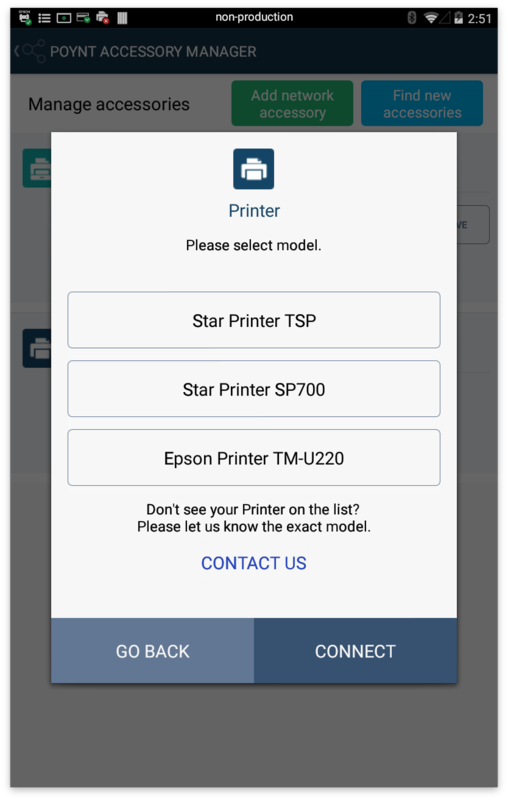 This will be used as your default printer unless you update Printer Preferences or toggle off your Poynt printer in Manage Accessories. 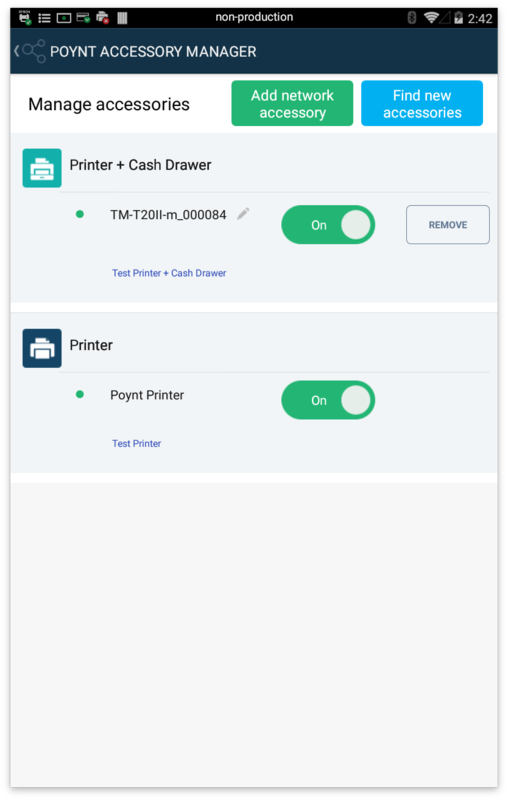 Once you connect an external printer above, you may want to use multiple printers for difference receipt types. 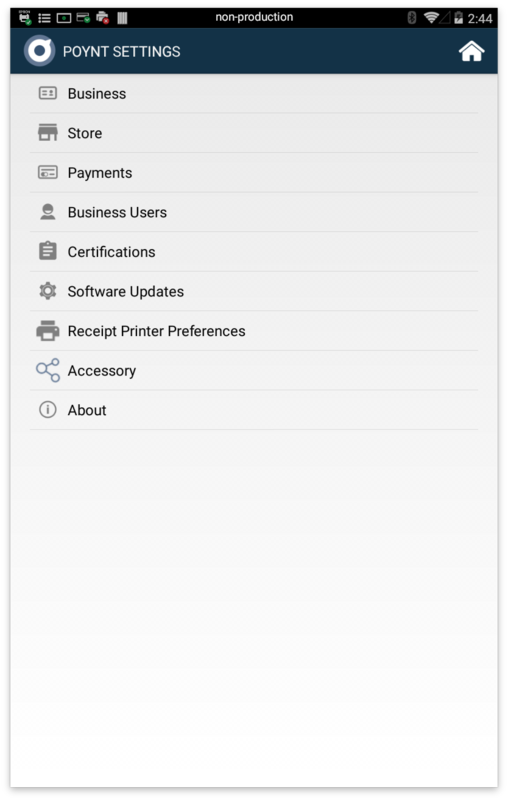 You will need to edit “Receipt Printer Preferences” to determine which receipts you would like to print.